Nebrich participating in the 2018 Davidson County High Schools Championship meet. She won the high jump event cleaning the bar with a leap of 5' 2". Photo by Gini Chauncey. Athlete Mary Nebrich with Coach Kevin Troy. Photo by Gini Chauncey. WDHS Track Coach Kevin Troy did see a future for the tall ninth grader, who he convinced to give the high jump a try. Even though her introduction to the sport lasted less than 30 minutes, Troy felt Nebrich had what it took to become a force in the high jump. Nebrich arrived at West Davidson already an accomplished athlete. She excelled in swimming, a sport she took up at an early age, and basketball. She credits her parents, both of whom played basketball in college, as being a positive motivational influence on her as she advanced through her primary and middle school athletic years. Despite having an already full athletic schedule as a freshman, Nebrich found she had time for just a little more. When Troy approached her about possibly doing the high jump, Nebrich decided to give it a try. Troy knew the potential was there, he just had to find a way to bring it to the surface. With her hip injury feeling better, Nebrich returned to the track for her sophomore campaign. She felt slightly apprehensive upon her return, fearing a setback or another season-ending injury. As her sophomore year progressed, she managed her practice time in basketball and fought through general soreness in preparation for a return to the high jump. Losing her freshman season put Nebrich behind her other competitors, but she was determined to get up to speed as quickly as possible. Once the work started, however, she realized there was a lot more to the sport of high jumping than she originally imagined. Troy saw the progress Nebrich was making, but he also saw the many areas his fledgling jumper needed to work on. From there it was all about convincing her that she had what it takes to succeed. Nebrich started coming into her own during her junior season. Troy successfully integrated Nebrich’s athleticism from her other sports, particularly basketball, to help her get the feel for clearing a bar sitting at eye level. 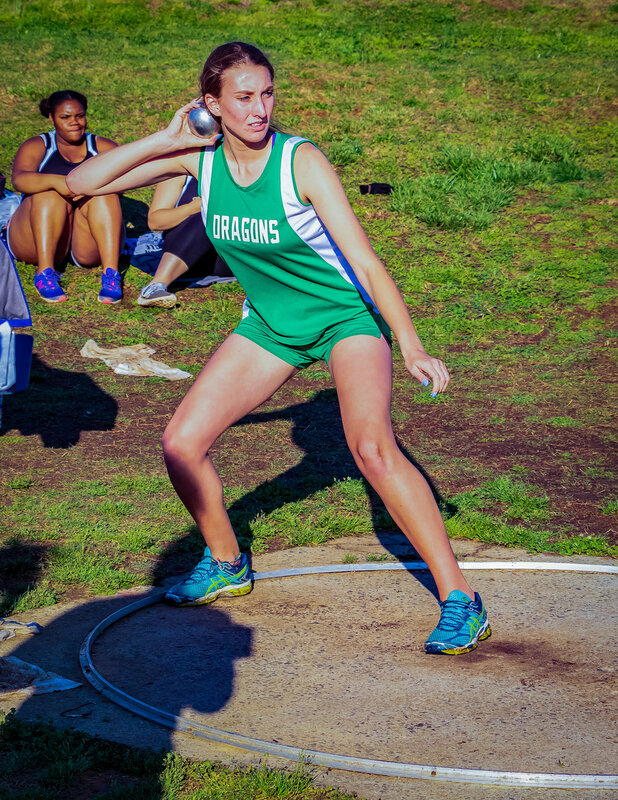 Despite a successful season that saw the Lady Green Dragons claim the conference and county championships, and Nebrich herself placing second in the regionals, there still remained one last barrier – 5 feet. Determined to clear the significant mental hurdle, Nebrich pushed herself on and off the track. She put in extra work in the weight room and was often spotted on weekends refining her skills. 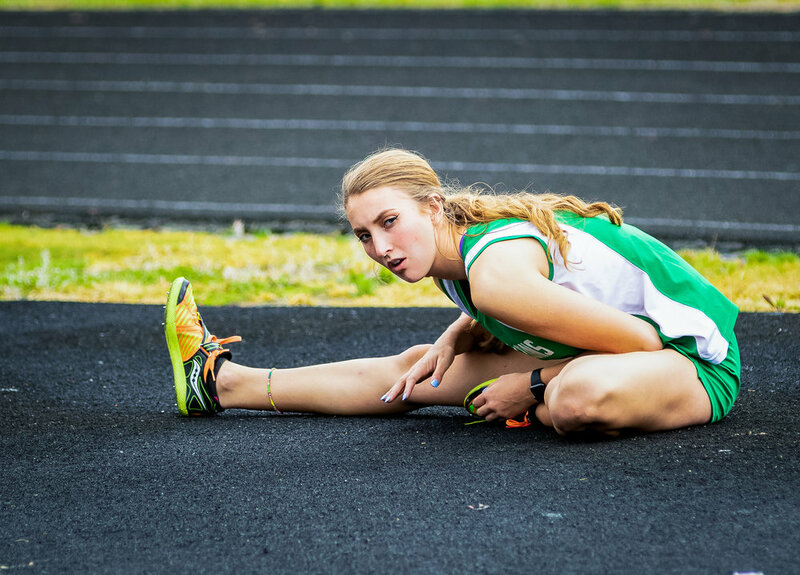 Her efforts came to fruition on a crazy day earlier this season when the senior competed in all three of her athletic loves in the same day. After qualifying for the state finals in both swimming and indoor track, both of which were scheduled for the same day, Nebrich had a decision to make. Being she also had a basketball game the same night, the possibility of competing in Raleigh, Winston Salem and Troy on the same day seemed daunting. Thanks to her parents, and a little caffeine, Nebrich completed the trifecta, capping the day off with a 20-point effort on the hardcourt after showing up to the game at halftime. As Troy predicted, once Nebrich cleared five feet her high jumping career took flight. As her senior season winds down, Nebrich is constantly pushing herself. She plans to again compete against college high jumpers as she decides her future. Several options remain on her table and she’s in no hurry to make a decision just yet. While scary, Nebrich would recommend the high jump to any young athlete looking to challenge themselves both physically and mentally. DENTON - This past May, Hannah Cranford decided to stop playing AAU basketball to focus on her running. Her events are the 800, 1600 and sometimes the 3200. It may turn out to be the best decision of her young athletic career. Many colleges recruited Cranford. She has decided to run for Campbell University this fall.